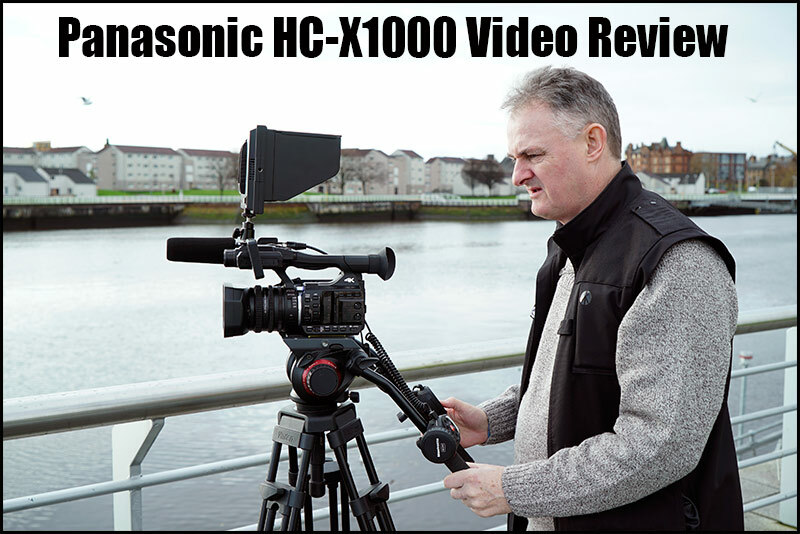 Finally the Panasonic HCX-1000 Video Review is now online, due to the addition of Panasonic’s CAM remote and ZOOM S/S you can turn the 4K HC-X1000 into a studio camera. 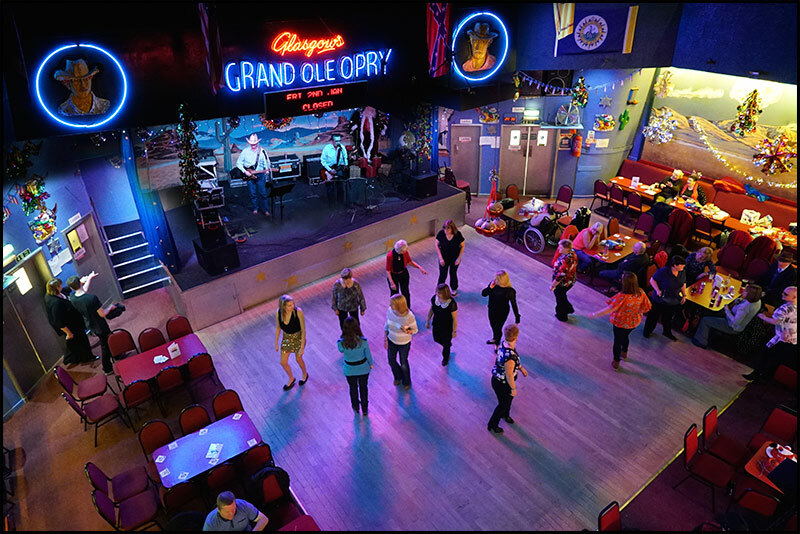 I got an offer I could not refuse…to film in Glasgow’s legendary Grand Ole Opry for some further low light assessment with the Panasonic HC-X1000. This review was due on Friday but I think a further test at 10dB’s in 4K will confirm my suspicion that 4K 50p low light filming is the way forward. Some people who have “reviewed” the HC-X1000 have been very unfair in their low light assessment of this camera, they never bothered to film in true low light situations let alone film in 4K ! While we were filming some test footage I noticed this Panasonic P2 HVX-200 filming in the balcony. 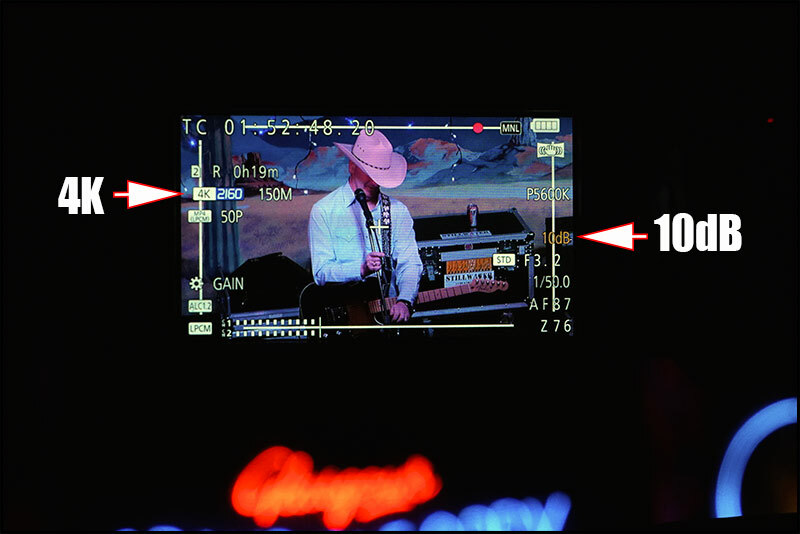 Two students from SAE and Glasgow Uni were part of a team producing a small documentary about the Grand Ole Opry, that took me back, I used to own one of these cameras…4:3 LCD, switchable via the menu to 16:9. Graeme is pondering whether to buy one of the HC-X1000 camcorders to replace his AC90. Many thanks Philip. Great review! Why was the HVX-200 you owned limited to a 4:3 aspect ratio? Every other HVX-200 can be switched between 16:9 and 4:3 in SD mode, while HD mode always is 16:9 anyway. HDW : Ah…Bernd, I meant a 4:3 LCD, thanks for pointing this out. thank you for the review of the HC X 1000.You have made some 4K tests and finally how would you compare: PXW- X70, PXW-Z 100 and the HC-X 1000? HDW : The Sony PXW-Z100 is a great camera but cannot match the HC-X1000 for low cost media (SDXC) nor low light. In HD mode the Sony PXW-X70 is quieter but the Panasonic Matrix gives a better out of the box colour rendition it also beats the X70 if you film in 4K 50p and edit on an HD timeline. One more question (I havent found it in a brochure) is there a time lapse function on the HC- X 1000? Thanks in advance and have a nice sunday. HDW : The camera is completely manual if you know what you are doing…In 4K 50p on an HD timeline the pictures are stunning, I at least show you the footage this review has no footage and I spent 4 weeks with the camera how long did this reviewer have the camera for ? 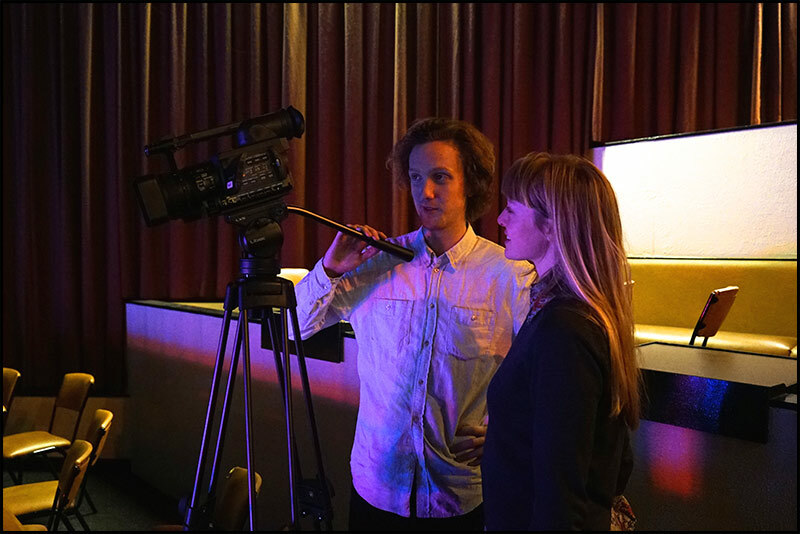 Lastly I have 25 professional video years behind me…Need I say more ! At the highest quality for the x70 (HD) and the highest quality for the X1000 (HD) what does better in low light? also how much better is it? HDW : Don’t know I did not test the camera against the Sony. Nice review looks like the camera has a lot of nice features I wish my FDR-AX1 had. Would be interesting to really get a side by side comparison of the FDR-AX1 ( a consumer camera with similar specs though admittedly more expensive media, which has been out for a year by the way so the HCX1000 is not the first ). 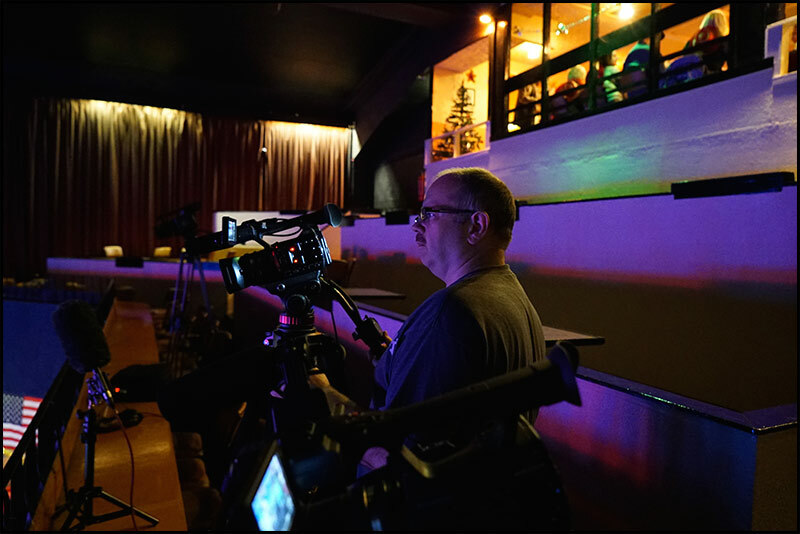 Your low light examples for me who shoots all the time in the theatre appear to be bright stage lights which on my NX5U would mean F4 at -3db gain and the values you got with the HCX1000 would be close to what I would get with my FDR-AX1. Reenforcing my thought that they use the same Sony sensor. 1/2.3″ 18900K pixels, video effective 8290K for 3840×2160 and 8850k for 4096×2160 as a 16×9 crop from the full sensor. Panasonic lens 49mm filter F1.8 to F3.6 Sony FDR-AX1 filter diameter 72mm F1.6 to F3.4. I’m curious why you didn’t compare the image quality and low-light performance to the GH4 (clearly inferior by other reports). I notice it has the typical Panasonic shift red to orange or brown (noted from sample slips compared to Sony clips). There is also a shortage of mounting points on this camera for radio mics etc. The battery are weak so I’m skeptical about the claims of recording times. I won’t be buying one. HDW : Gerald why on earth would I compare a DSLR to a video camera…large sensor cameras will always come out on top for low light. You noted AC90 clips, the AC90 does not have an infrared filter while the HC-X1000 clearly has. “The batteries are weak” compared to what, they are no better or worse than 5800mAh Sony or JVC Lion batteries, once again Gerald you read far too many bad, inaccurate internet reports. Thank you for the review of the HC X 1000. Is there any difference if stored on sd card or external via HDMI? HDW : HC-X1000 is 8bit 420 in HD and from 4K to HD it becomes 444 10bit, don’t know about external drive via HDMI…yet ! For information only on my Sony camera comparisons. I managed to have a demo unit of the X70 for an evening last week and did an unscientific test in my living room against my cameras. Field of view was as close as I could get them and all were on automatic exposure with shutter fixed at 1/60. Late afternoon starting to go dark outside. NX5U F1.7 9db , X70 F2.8 24db , NX30U F2.0 18db, AX1 F1.7 24db. Any darker the NX5U going to 12db starts to show grain but NX30 is still OK at 21db or more as is the X70. I feel the NX30U is slightly better in low light than the X70 which has more detail of course. The X70 lens is of course wide open at F2.8 giving the advantage to the others and although has a larger sensor has smaller pixels. The NX5U and AX1 have much the same lens ( may even be identical !!) All had about the same picture brightness though the grain was very clear on the AX1 I have found 18db is the limit for my uses and have the AGC limit set there just do not use if its any darker and fall back to my XR500 or CX700. Unless the image is bright enough for gain to be less than 9 db on the AX1 then cropping is not really usable but downconverted images are great with gain to 18 db. I imagine the HC-X1000 would be the same. HDW : No its not got slow motion. I’m looking at buying this camera, and I did come across one singular complaint that this camera did not have a true 4k resolution compared to another 4k camera, which the reviewer redacted along with the shooting conditions. I’m not giving the review much credit, but I would still like to verify the 4k resolution. Thanks! HDW : I think you will find it is 4K 3840 x 2160 (16:9) perfect to match 16:9 footage on an HD timeline. You also have 4K 4096 x 2160 (19:10). Both 2K and 4K non 16:9 are less popular. By the way I forgot to ask where can I buy panasonic cam remote and zoom s? How much does each item cost? Greetings from Miami, Florida. Yeah, I read so many bad reviews people saying that this camera is terrible in low light or cloudy days, I’m going to buy one soon in amazon.com and if I don’t like , I will return it. HDW : They are made by Manfrotto, the zoom control is a MVR-901 and the focus/iris control is a 521PFI available from most reputable pro video retailers. I see your buddy was shooting on the ac90 and you were shooting in the hc-x1000. How would you rate the low light between the 2 cams? What camera looked more sensitive with less noise? HDW : Unfortunately my friend films with intelligent auto so I don’t know what his gain was ever set to but the main point was the lack of IR filter on the AC90 compared to the X1000. Superb review of the camera Philip. I tend to have a view when looking at camera purchases of going for the highest bitrate possible (its not the only requirement I look at I hasten to add!). But I’d be interested to hear your views on the quality of the image from the HC-X1000, which appears to be recording 4K at around 100mbps, as against the Sony PXW-Z100 which is 500-600mbps. That seems quite a drop in recorded data to me, but I’m wondering how much is down to the AVC Ultra/XAVC codec compression and how much is simply lower bit rate. I accept there are other issues, such as low light and recording medium to be taken into account, but on pure image quality (again bearing in mind they are different manufacturers) did you notice any major difference in the image quality between the Z100 4K footage and the X1000? Also is there any pre-record that you found on the X1000? Assuming there isn’t as I haven’t seen it mentioned anywhere. HDW : The Panasonic HC-X1000 at 4K 50p is 150MB/s, now I never got to see 4K as I don’t have a 4K monitor but thats not the issue with this camera, you are looking to film in 4K just to give you a fantastic HD picture. The Sony Z100 is very limiting with its 500MB/s expensive XQD cards and very poor in not only low light but outside in shadows, can’t complain about the picture but its very limiting due to the horrendous small record times in 4K. 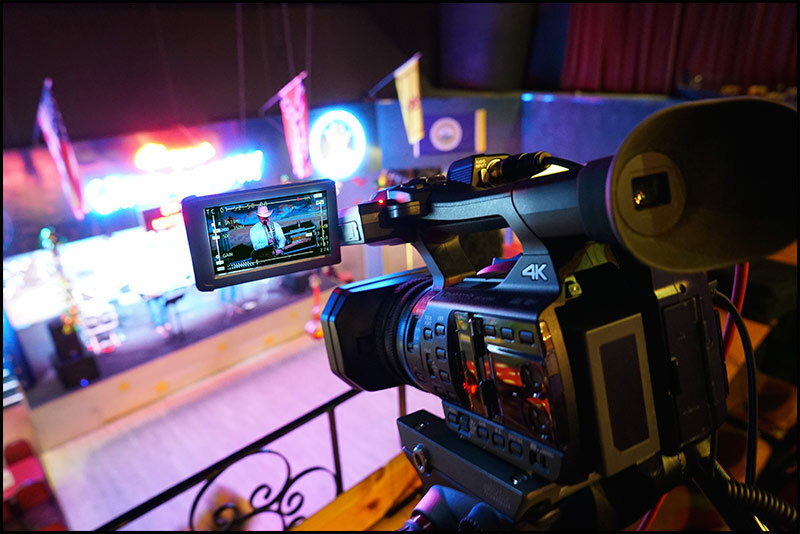 The HX-C1000 has a 5 sec pre record which also works in 4K mode. The FDR-AX1 is more like the HC-X1000 than the Z100. Uses lowest cost XQD cards ( still more expensive than SD ) I have had my FDR-AX1 for a year now it was brought out at the same time as the PXW-Z100 as the consumer version. It records XAVC-S, at 150Mbps just like the HC-X1000. Not the same codec but the same data rate. I have just found this vimeo comparison. Very similar but I think that the FDR-AX1 has a slight low light advantage I think and a little sharper. Both start to show considerable grain above 18db which is where I have my gain limit set on my FDR-AX1.!!!! HC-X1000 has a very nice set of features. Still do not know why they did not include touch focus with everything else operated by the touch LCD !! Thanks for the great review. I have recently started using this camera for studio and event work with generally good results. One question I haven’t been able to track down in the manual is why my external monitor shuts off when I turn on remote control for the iPad app. I assume that the camera cannot process both the remote control preview and the external monitor at the same time. Do you have any insight on this? HDW : Its normal for most cameras to shut off external monitoring if WiFi is enabled to save on processing. HDW : Sometimes cameras can be too sharp, but if you have an FDR-AX100 I don’t understand why you need another 4K camera, remember the HC-X1000 also comes from the domestic stable, although it is packed with professional features. Hi HDW, thanks for your answer. My plan is to use the AX100 in travels and simplest things, without responsibility or commitment. But to shoot weddings, graduations, birthdays and other social events I plan to use a more professional level camcorder. 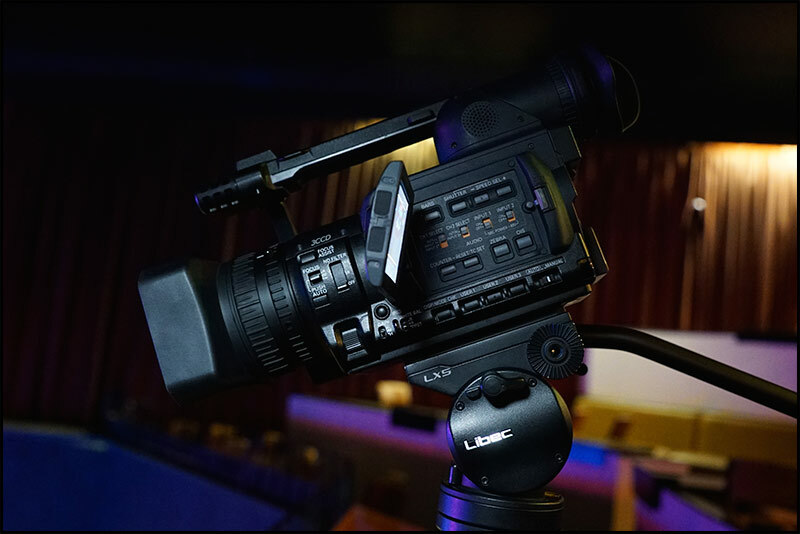 The HC-X1000 is a prosumer camcorder, but it has the features I would like to use. I understand that it will not have the same performance at low light than a camcorder with larger dimensions sensor can deliver (like FDR-AX100 or DSLR GH4), but this is no problem for me because I have several sets of LED lights to the most varied situations. But if you want to charge more from a footage done in 4K the sharpness MUST BE much higher , because your clients can doubt if a movie in 4K cannot display more details than a 1080p movie already does today. 4K movies must be stunning, must be extremely sharp to surprise everyone who see it. Then it is unacceptable to pay US$ 3,500 for a camcorder if it does not deliver this level of sharpness. May be HC-X1000 have a focus problem. Who knows ? Thank you for the review. I have bought the camera. I have the Panasonic AC 90, if you want to compare Hx 1000 to Ac 90, Ac 90 is better for low light even if I gain up to 30db It doesn’t make noise at all. however, Hx1000 makes noise. In partial reply to what Joe says, I would like to let you know that I am going to send my HC-X1000 back to Panasonic for a check, because it makes an incredible amount of noise indoors. I use to record organ and classical music concerts, particularly in churches (see my “gianco50” channel on youtube, and look for the quality of the most recent clips (I mean “noise” quality, not artistic quality!!!). I have three Sony Handycams (cost= between 700 and 1200 euros each) and they do not show virtually any noise with that kind of lights. I bought the Panasonic to improve, and the results are terrible- compared to the Full HD Sony’s – with any kind of recording settings (e.g. 4K/25, 1080/25p, etc.). I feel really frustrated, but I still do hope that the X1000 is faulty. Otherwise, I have simply wasted 2,600 euros and …bye bye Panasonic, forever! One question unresolved for me by an otherwise very nice review; how did you find it off tripod as am wondering how it would cope in a R&G type scenario? At the moment am trying to decide between this and the Sony X70, which apparently has digital stabilisation as good as the NX30’s gyro based system which is impressive, any idea how the Panny compares? Thanks for the info and effort put into the review, appreciated. HDW : You won’t get much to compete against the Sony’s stabilisation on the X70. i want to purchase for wedding video..so tell me which one is the best sony nx1 or panasonic ag ac 90 or panasonic hc x 1000 4k??? I want to purchase for wedding video..so tell me which one is the best panasonic ag ac 90 or panasonic hc x 1000 4k??? HDW : If low light is your priority you need to look at the Sony A7s, thats my camera of choice for low light work. We have two of these and I love them. They replaced a couple of AF100’s. I couldn’t believe the price. I also saw the poor review (mentioned above) early, but as soon as I saw the “no manual control” comment I knew the reviewer was mistaken. I took, the rest of the review with a grain of salt. Sometimes I wonder where this reviews originate! We have a GH4 for the more cinematic stuff, but as a good daily workhorse these cameras are great value and easy to use. Thanks for the review Philip. I am using Avid as nle. When I import the 4K material into a HD project, will this be 4:4:4 or do I need to import it in a 4K project and then open it in a HD project? Can you tell me what remotes you are using to control zoom S/S etc on the x1000, I see there are two seperate ones in the picture, many thanks. i want to purchase for wedding video..so tell me which one is the best sony nx1 or or panasonic hc x 1000 4k??? I have been using semi pro camcorders since 1992 and your review made me buy an X1000. I am well impressed with the feel of the camera and the very easy menus. I have a full size JVC GY-DV 700WEK ex broadcast machine and the images from this cannot come close to the X1000. i have just brought a 4K TV and i cannot tell you how clear the images really are. I have just buy this video camera. I want something more about this camera. You should do what I did: sell the Panasonic and buy a Sony! The Panasonic 4K , whatever people say about configuring it properly, in low light IS A TOTAL DISASTER. Grainey grainey grainey even sometimes in sunlight????? Please help. Its seems a duff Camcorder and I cant afford another???? HDW : Have passed your details onto the distributer. Superb review of the camera philip.